This trash can may be expensive, but reviewers say that it's worth every penny. The simplehuman Stainless Steel Rectangular Kitchen Step Trash Can is a highly functional, incredibly sleek product that will serve you well for years to come. This model has a 12-gallon capacity, and its classy stainless steel finish and rectangular shape make it less of an eyesore than your typical trash can. What's cool about this product is that it has an innovative liner pocket that dispenses liners inside the can, as well as a liner rim to secure the bag in place. It has a silent close lid, and its wide pedal is engineered to last more than 150,000 steps. Reviewers rave that this product is beautifully designed, durable, easy to use, and easy to clean. Many people say they use the product with the recommended brand liners, but several others note you can use regular 13-gallon trash bags, as well. Some of today's more advanced trash cans cost upwards of $100, but you don't need to shell out that much money to get a quality product. The Hefty 13.3 Gallon Pivot Lid Trash Can is a great option if you're on a budget, as it provides all the functionality you need with an affordable price tag. This plastic trash can has a 13-gallon capacity, and it looks rather expensive thanks to its shiny black finish. The product features a pivot-style lid that's easy to remove, and the slim rectangular shape allows you to tuck it into tight places. Reviewers say this is an incredibly sturdy plastic trash can and it does a great job of keeping odors contained. The only downside is that once the trash gets full, you won't be able to put a larger item in without blocking the pivot top from closing properly. Stainless steel trash cans are popular for several reasons. Not only do they look sleek and match many modern kitchen appliances, but they're also more durable than plastic products and do a good job of sealing in odors. The simplehuman 30-Liter Fingerprint-Proof Brushed Stainless Steel Round Step-On Trash Can is a quality stainless steel kitchen trash can that gets top marks from happy customers. Its sleek finish makes a nice addition to any kitchen (no matter the decor), and it also resists fingerprints and smudges, making it perfect for families. The lid opens easily when you press the steel foot pedal, and it closes slowly to prevent slamming. Plus, it features a liner locking mechanism to keep your trash bag in place. Oh, and this trash can has a non-skid base and stay-open feature that can aid in kitchen clean up—it really does it all! Wary of germs? Then you might prefer a trash can that you don't have to touch at all. The iTouchless 13 Gallon Stainless Steel Automatic Trash Can uses motion-sensor technology to automatically open the lid, making it a hygienic, convenient product. This 13-gallon trash can has a fingerprint-proof stainless steel finish, as well as a carbon odor filter to neutralize smells. It has an extra-long battery life since it only uses power when needed, but you can also purchase an AC adapter separately if you choose. Reviewers love the appearance of this trash can, as well as its impressive functionality. Most agree the motion sensor works great and say you only have to change the batteries once a year. Plus, several reviewers say this product has lasted them several years, making it a worthwhile investment. Swing top trash cans allow you to put items in without having to open or close a lid. Our top choice for this category is the Sterilite 13.2 Gallon Swingtop Wastebasket. This durable plastic kitchen trash can is rather plain, but it will get the job done and hold up well over time. This trash can has a 13-gallon capacity, and it features a dual-action swing top lid. The product is perfect for use in the kitchen or other areas of the home, and it fits standard 13-gallon trash bags. Reviewers say this trash can takes up minimal space and keep their animals out of the trash. Plus, many reviewers said that it has stood up to several years of wear and tear. Butterfly top trash cans have split doors that open from the center, allowing them maximum clearance under low countertops. If you're looking for this style of trash can, consider the top-rated simplehuman 30 Liter / 8 Gallon Stainless Steel Butterfly Lid Kitchen Step Trash Can. This stainless steel trash can is smaller than most with just an 8-gallon capacity. It has a silent-close butterfly lid, as well as a steel pedal that's engineered to last more than 150,000 steps. The slim profile of the trash can allows you to tuck it into narrow spaces, and the exterior is fingerprint resistant, making it ideal for families. Reviewers write that it's a wonderful trash can that not only looks great, but effectively blocks out smells, is easy to clean, and is incredibly durable. If you have a large family, you know how frustrating it can be to have your trash can fill up in a day. No one wants to take out the garbage that often! Solve this problem with a product like the simplehuman 60-Liter Fingerprint-Proof Brushed Stainless Steel Step-On Trash Can, an oversized model that's perfect for large kitchens. 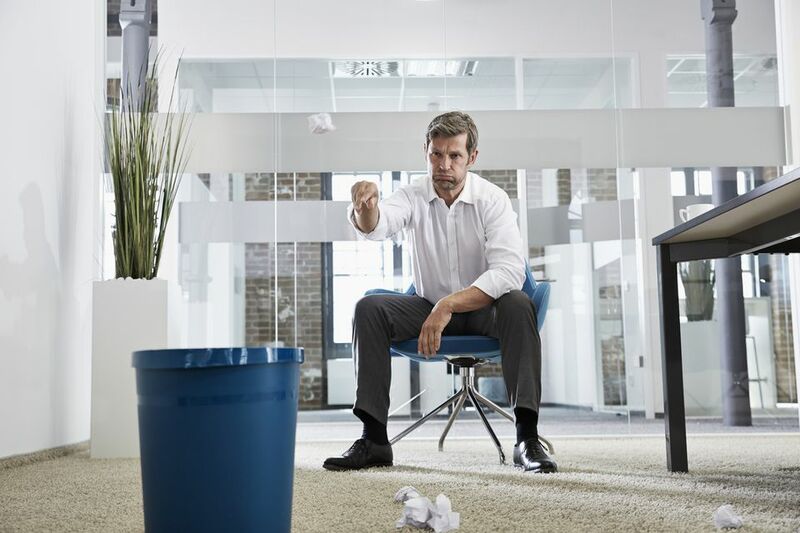 This trash can has a semi-round shape that allows you to place it flat against the wall, and it's 60-liter capacity holds significantly more trash than other models. It has a stainless steel fingerprint-proof finish that's ideal for families, and there's a built-in liner holder to keep your trash bag in place. Reviewers love this product, saying it holds the trash bag in place wonderfully and is easy to open and close via the pedal. Many note that this kitchen trash can is incredibly spacious and keeps pets out while locking in unpleasant odors. What more could you ask for? If you live alone or have a small kitchen, you might not need a full 13-gallon trash can. A compact alternative for small homes is the simplehuman 20 Liter / 5.3 Gallon Butterfly Lid Kitchen Step Trash Can, which features the popular butterfly-style top and a beautiful brushed exterior. 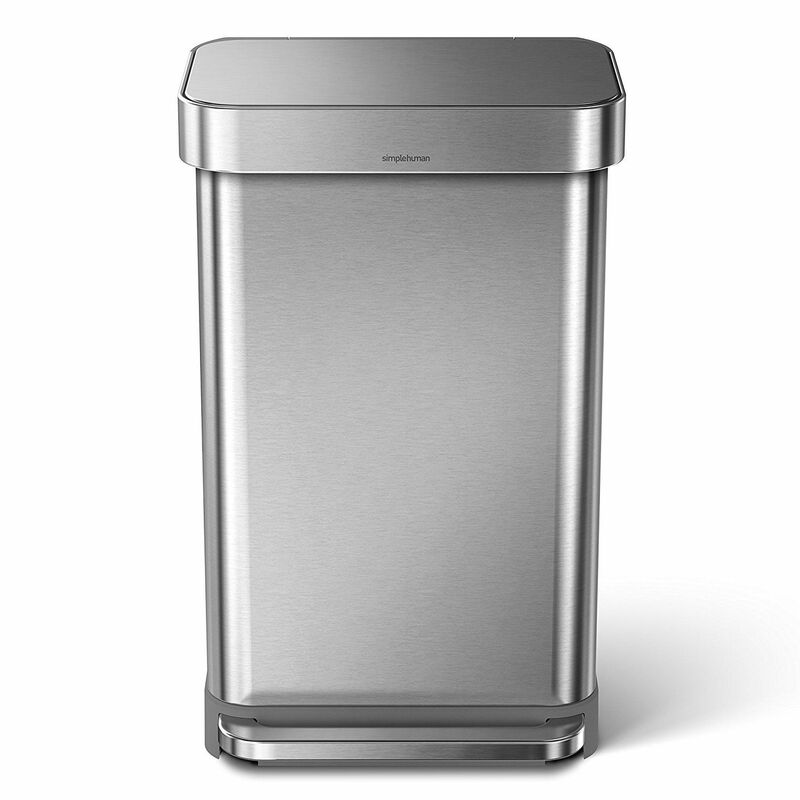 This product has all the features you'd expect from a simplehuman trash can—a stainless steel exterior, silent close lid, liner holder, durable pedal, and more. The innovative split doors open from the center and allow you to tuck it into small spaces, so you can squeeze it underneath, in between, or right next to your kitchen cabinets. Reviewers can't say enough positive things about this model, noting that it's a well-designed product that locks in odor while keeping out pets. Our writers spent 2 hours researching the most popular kitchen trash cans on the market. Before making their final recommendations, they considered 20 different trash cans overall, screened options from 8 different brands and manufacturers and read over 35 user reviews (both positive and negative). All of this research adds up to recommendations you can trust.